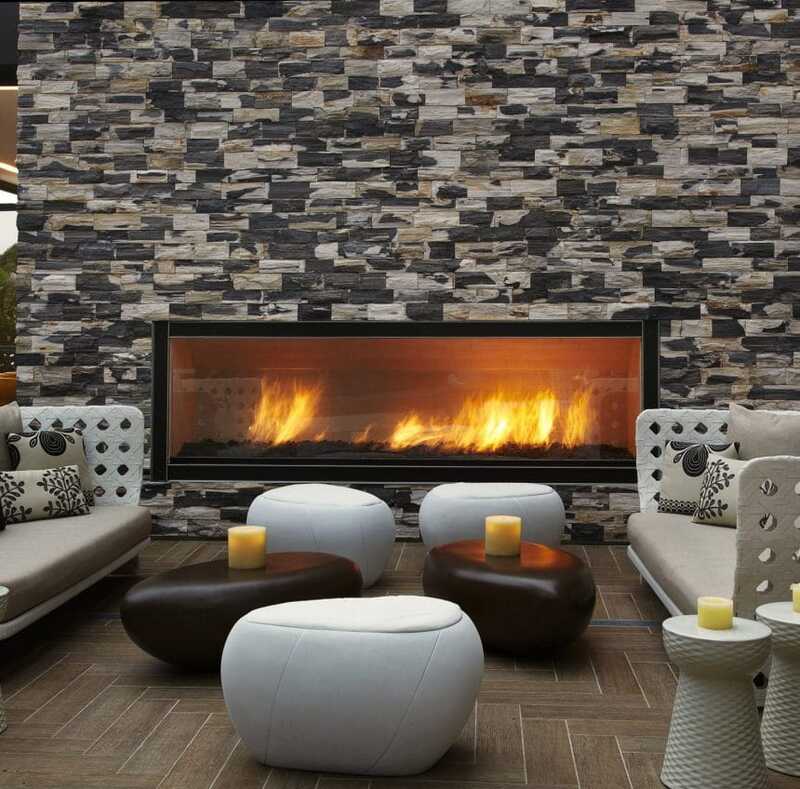 Find the best La Jolla hotels, from luxury to budget, for your next San Diego vacation. Some are beachfront, others have spas but they’re all top picks. I come into contact with tons of people who have no idea where La Jolla is. Here’s an intro. 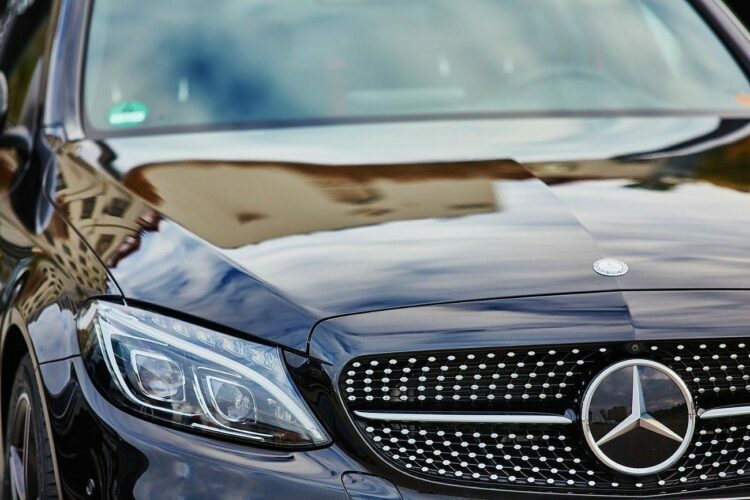 These black car services have been used by us for airport transportation and more. 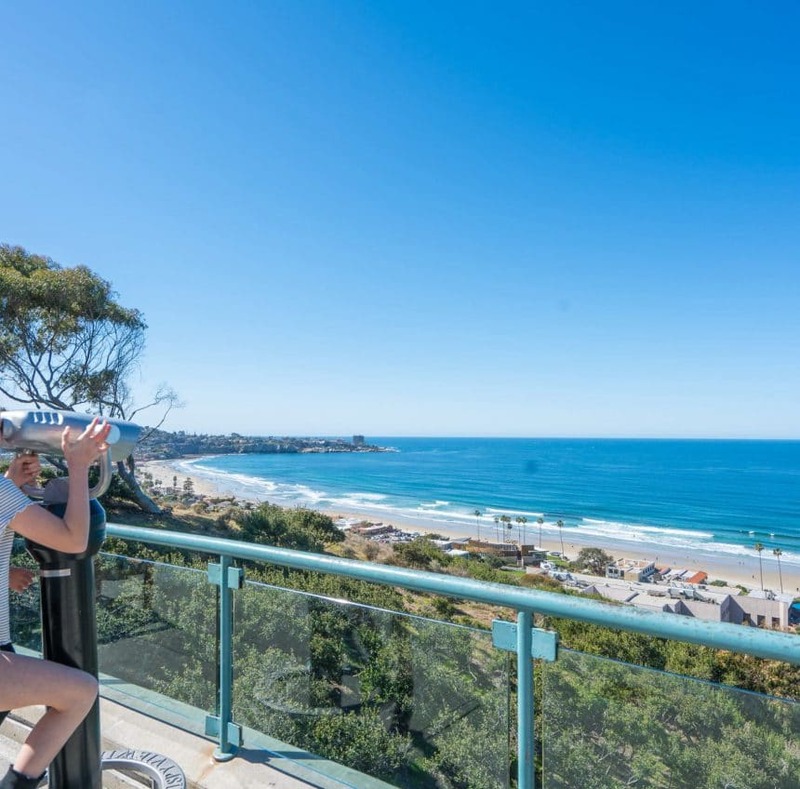 While La Jolla is often associated with the million dollar homes that dot the cliffs overlooking San Diego’s gorgeous beaches, this neighborhood is actually laid back. La Jolla (aka The Jewel) is popular with tourists who come to the area for the restaurants, the sights, and to photograph the famous La Jolla seals and sea lions. That said, a lot of people have never even heard of La Jolla (pronounced La HOY-a), and so it’s often times not as busy as some other San Diego neighborhoods. 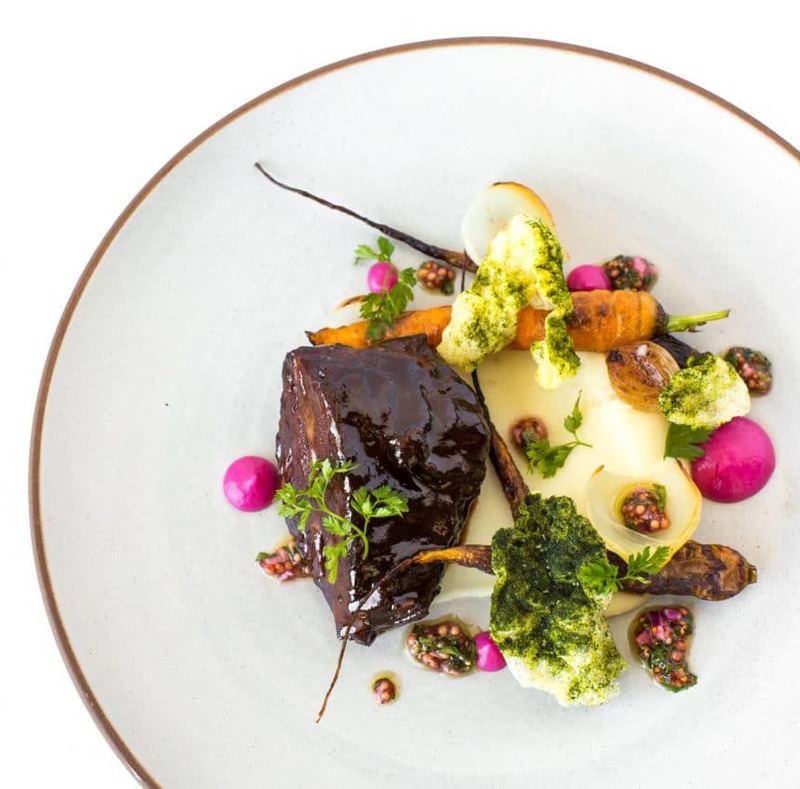 The vibe is relaxed, even though it’s notable for being the home of Torrey Pines Golf Course, the Scripps Institution of Oceanography, The Salk Institute, as an art incubator, and for having the Rodeo Drive of San Diego. 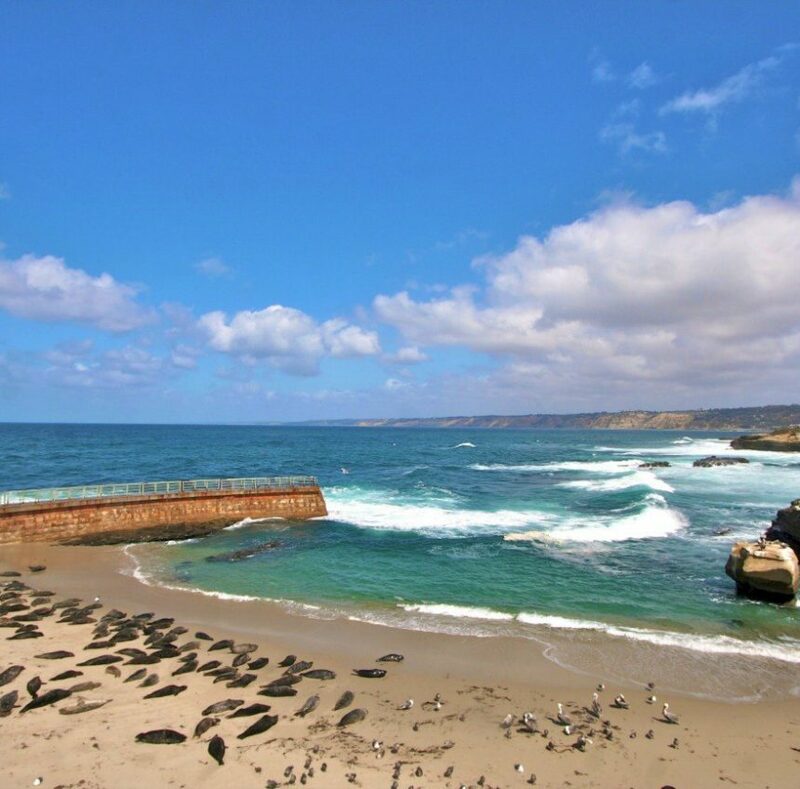 La Jolla beaches are also famous for their surf and the La Jolla tide pools brim with fascinating marine life. La Jolla is made up of multiple neighborhoods that you’ll need to drive between. Most tourists stay in The Village near La Jolla Cove, La Jolla Shores, or by Torrey Pines Golf Course near UC San Diego. 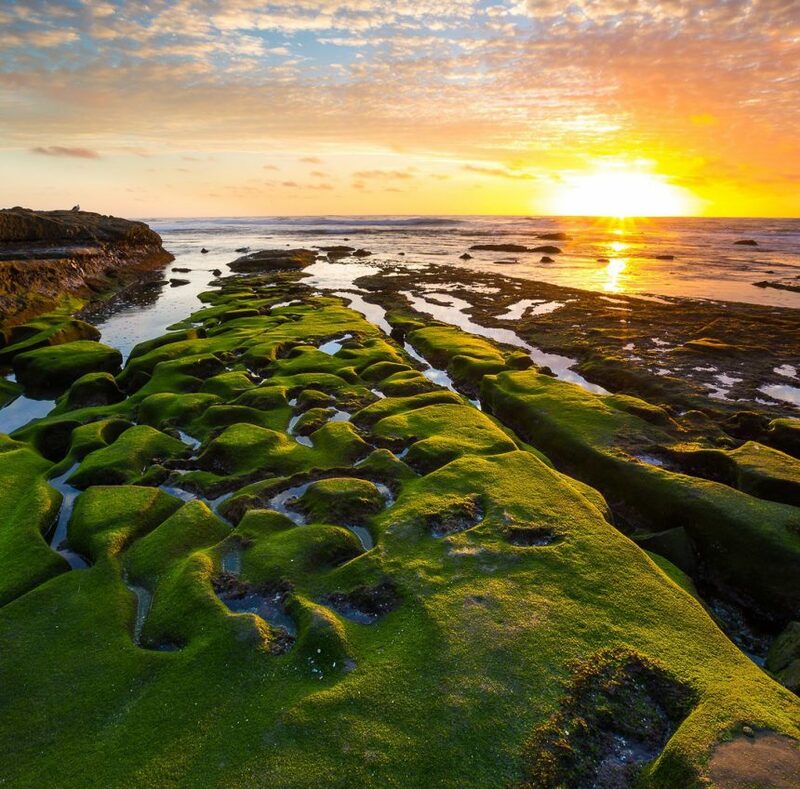 La Jolla has seven miles of rugged coastline — most of which is rocky, not sandy. 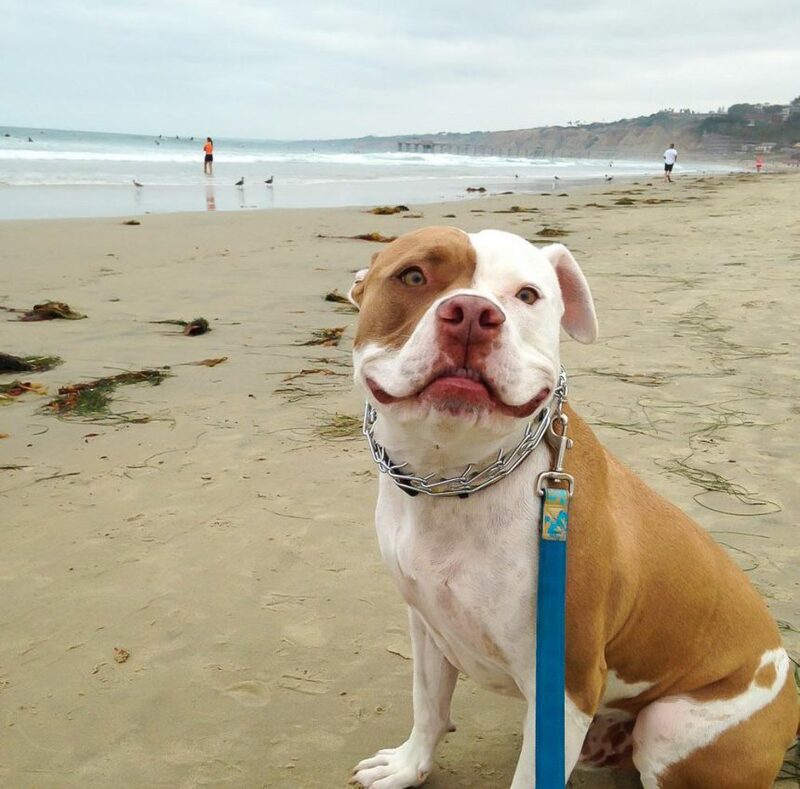 That said, there are various sandy beaches here and there along the coast, and these include some of the best beaches in San Diego. As to which are the best beaches in La Jolla, it all depends on what you want to do. Families tend to head to the Children’s Pool, where the seawall has created a beautifully calm spot, but not so much for swimming anymore since flocks of hundreds of harbor seals took over the beach. 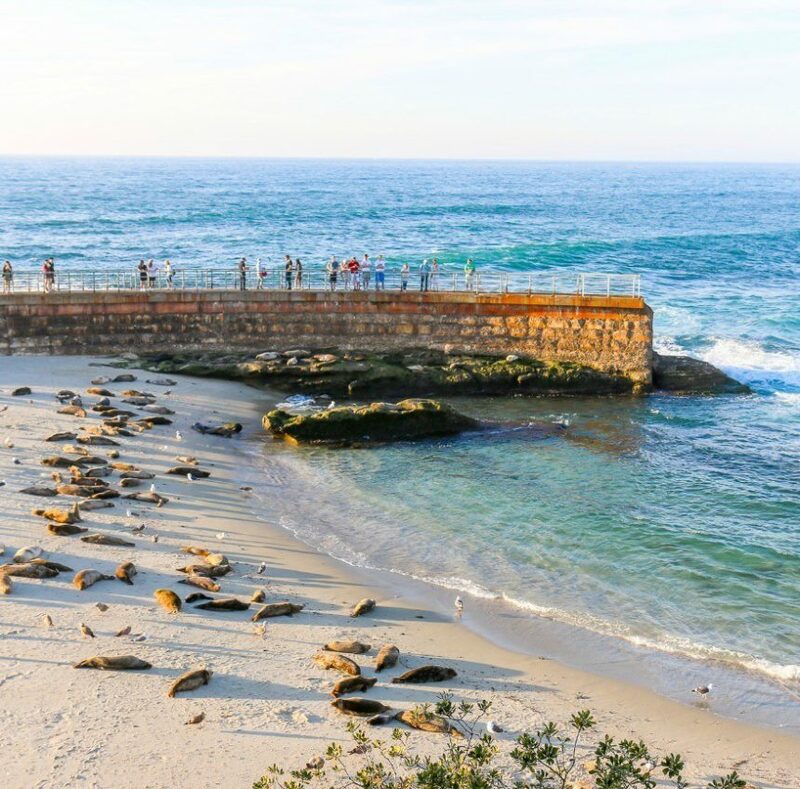 The place to see sea lions is down the boardwalk at La Jolla Cove, a beach that’s close to both the Sunny Jim Sea Cave and awesome scuba diving spots. Both are located in The Village. 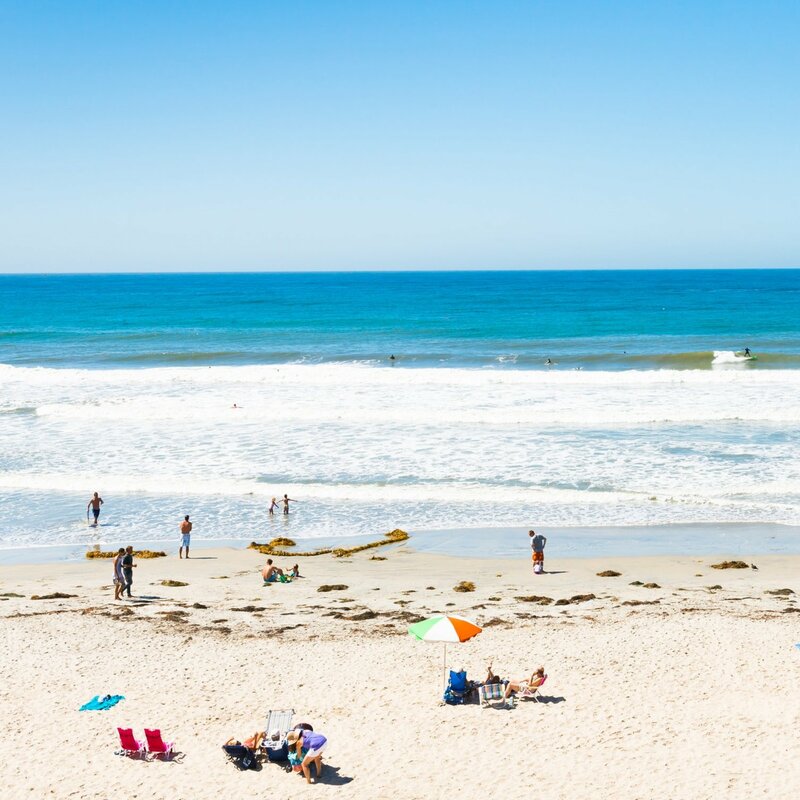 For swimming and calm surf (plus lifeguards, picnic spots, bathrooms, and showers), look no further than La Jolla Shores beach. There are play structures, kayaking tours, paddle board rentals, great snorkeling spots, and even better, a big parking lot, which is a rarity around here (though it can fill up quickly in the summer). This La Jolla beach offers plenty of sand for a glorious San Diego beach day. 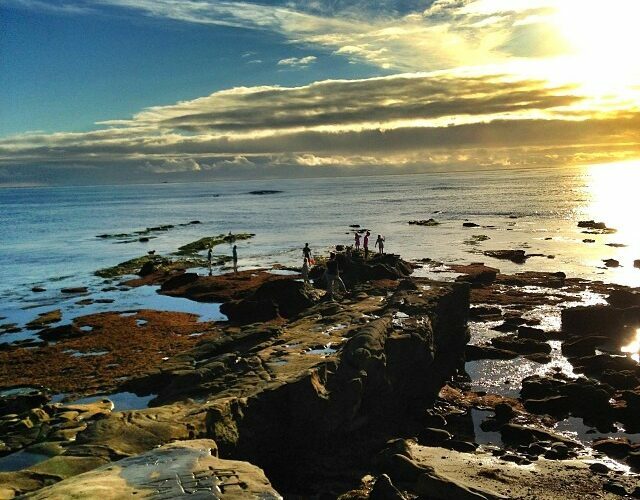 If you want to explore La Jolla’s famous tide pools in winter, Shell Beach is a great choice. There are plenty of tide pooling spots in San Diego, but Shell Beach and Wipeout Beach (in The Village) a few paces south definitely has some of the most colorful and interesting aquatic life. There are sea anemones, sea stars, crabs, and fish. La Jolla Shores is home to Dike Rock near Scripps Pier, a tide pool area studied by researchers and where Birch Aquarium naturalists lead public tide pool tours. And for surfing, check out Windansea Beach, which is considered one of the best surf spots in all of San Diego. That said, it’s not exactly beginner-friendly, because the waves vary with the tides and it’s hard to predict what the swell will be like on any given day. 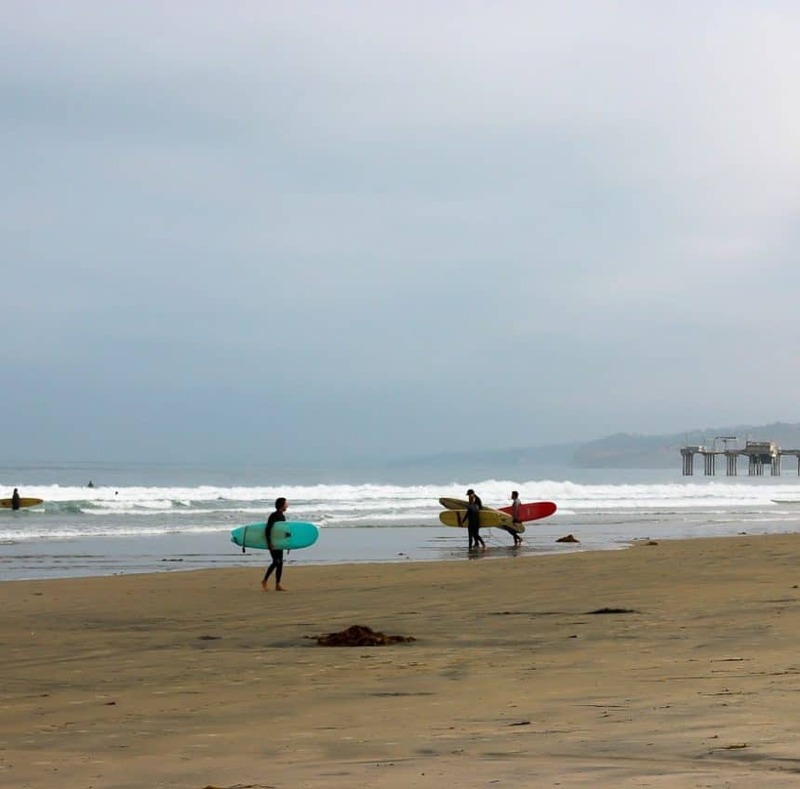 La Jolla Shores near Scripps Pier is another hot spot and where you can take a surfing lesson. People ask me all the time where to stay in La Jolla, and I always reply by asking what they’re looking for in a hotel. 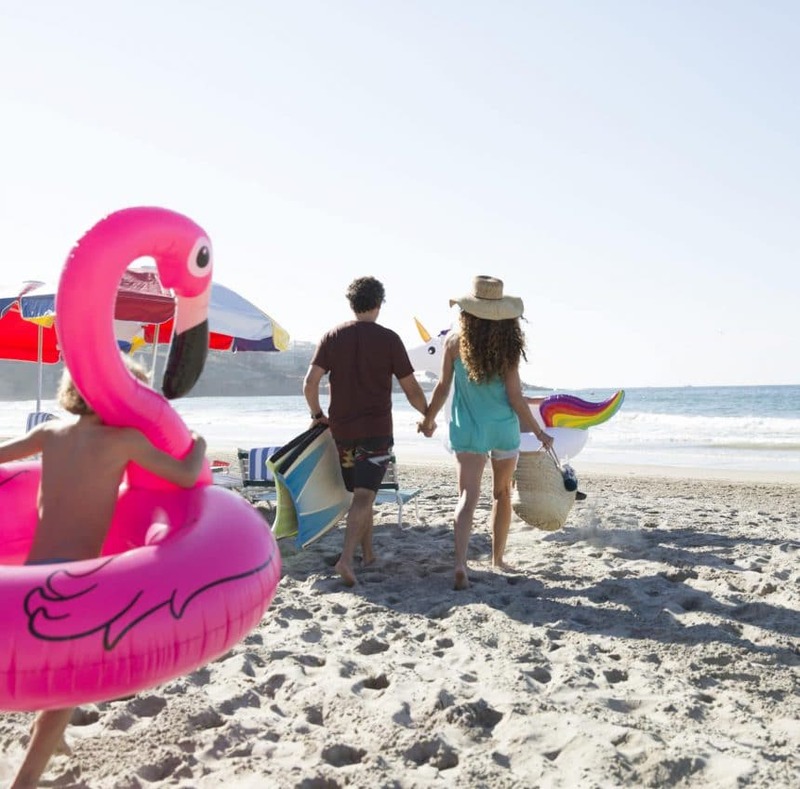 If you’re traveling with kids, you may be looking for a hotel experience that’s very different from someone who is traveling alone or with a significant other. 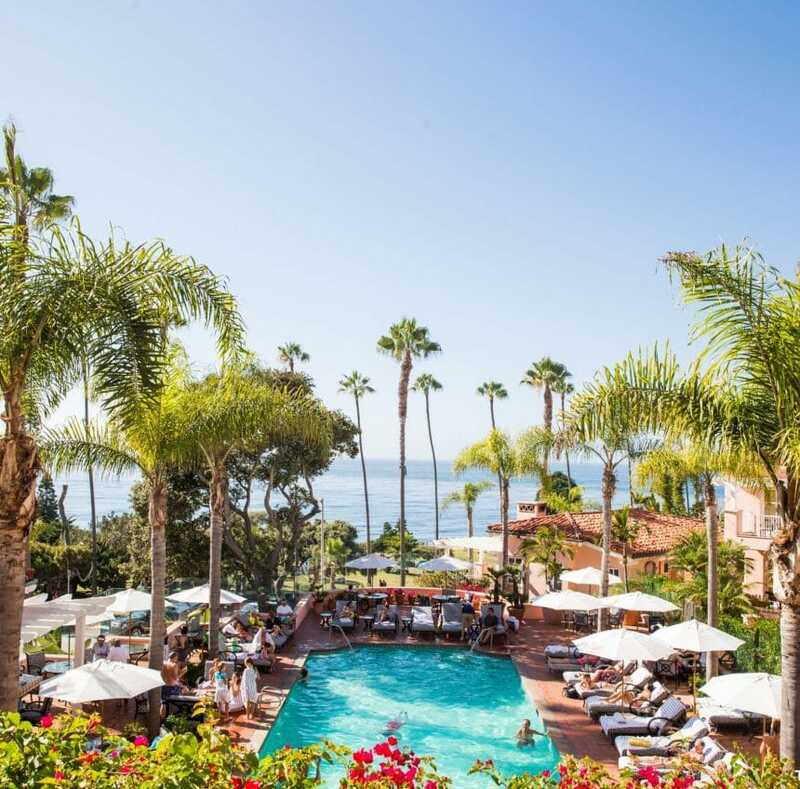 Most people who visit the area seem to want to stay near the beach, and I’ve spent a fair amount of time checking out the best beach hotels in and around La Jolla. The beachfront La Jolla Beach and Tennis Club (LJBTC) is part of an exclusive private club, and so you’ll have easy access to not only a beach that boasts some of the best snorkeling and surfing but also amazing tennis courts and a pitch-and-putt golf course. 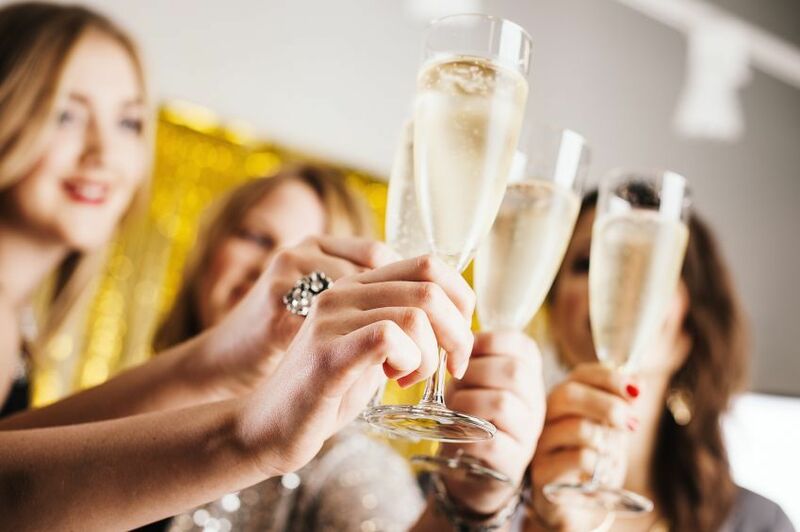 It’s also very family friendly, and it’s the kind of hotel where multiple generations of a single family visiting the area together can all get the amenities they want. It’s not a La Jolla beach hotel, but guests of The Lodge at Torrey Pines (my favorite La Jolla hotel) have access to complimentary concierge cars that can take guests to and from the sand and other sights within a 5-mile radius. 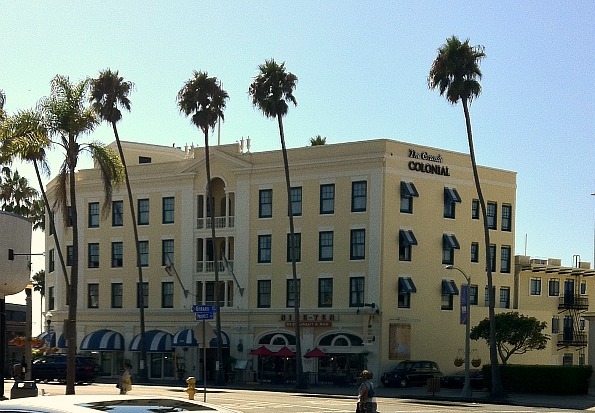 It’s the luxury hotel option in La Jolla and you have access to a discount and special amenities. 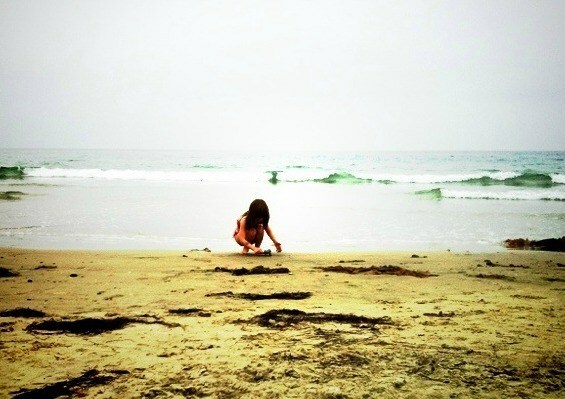 I may be biased because this is our home base, but I think visiting La Jolla with kids is absolutely wonderful. There is always something new and interesting going on around town, whether it involves outdoor activities like kayaking, surfing, stand-up paddle boarding, biking or watching the seals and sea lions or indoor fun like visiting the Birch Aquarium or shopping for new toys at Gepetto’s. 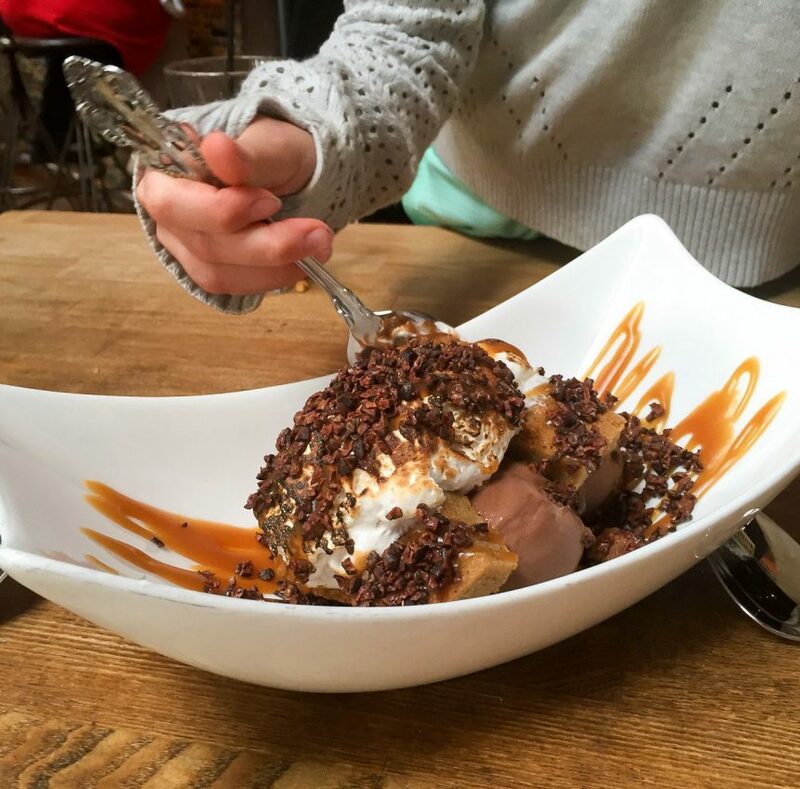 There are lots of excellent playgrounds in the area, plenty of kid-friendly restaurants, and kid-friendly happy hours where the whole family can kick back and relax. 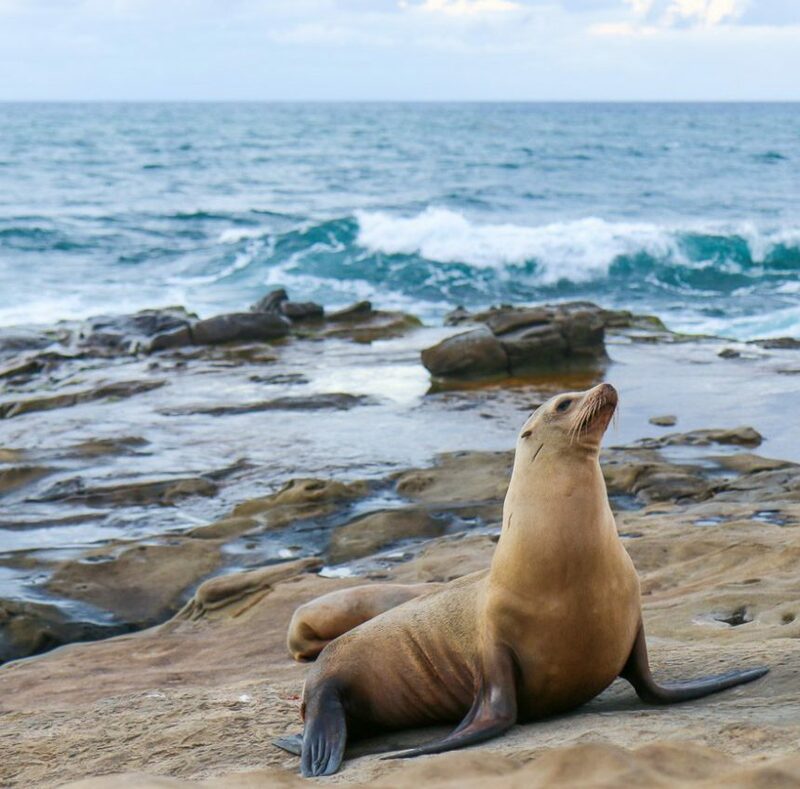 The most popular attraction in La Jolla is La Jolla Cove, where beautiful views of the Pacific Ocean are the backdrop against which sea lions frolic and gulls take flight. It’s a great place to take photos, but if you’re game to go in the water, it’s also a good spot for snorkeling. 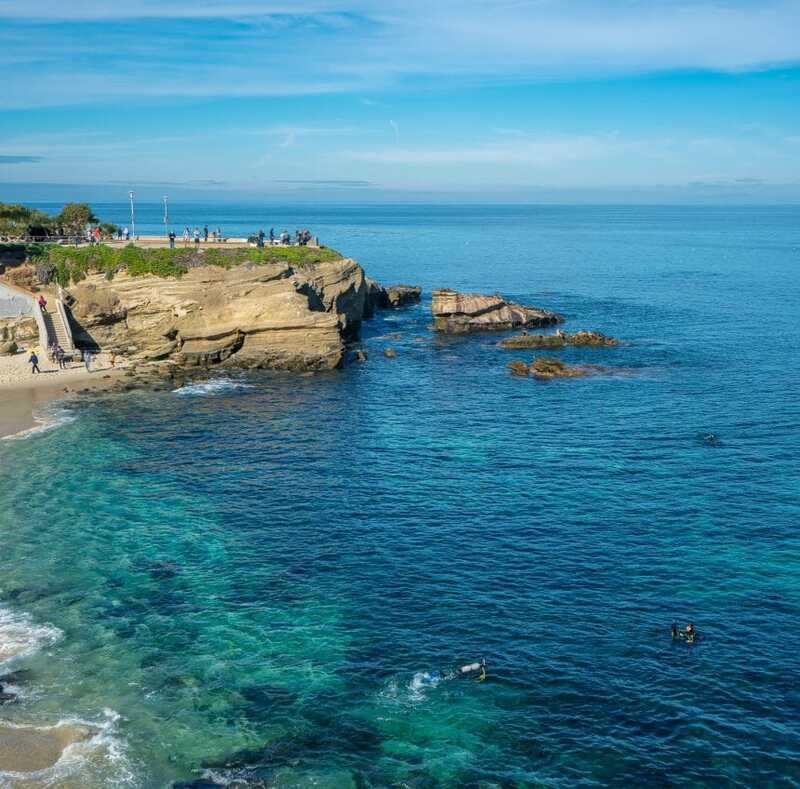 Home to the La Jolla Underwater Park, La Jolla Cove has orange Garibaldi (California’s state fish), sea stars, anemones, and lots of other animals to check out under the water. There’s also open water swimming under the watchful eyes of lifeguards, kayaking tours, and scuba diving. Then there is La Jolla Shores, the super relaxed neighborhood around the huge beach of the same name. It’s just about the best spot for a day out at the beach or a few hours of mellow exploration. 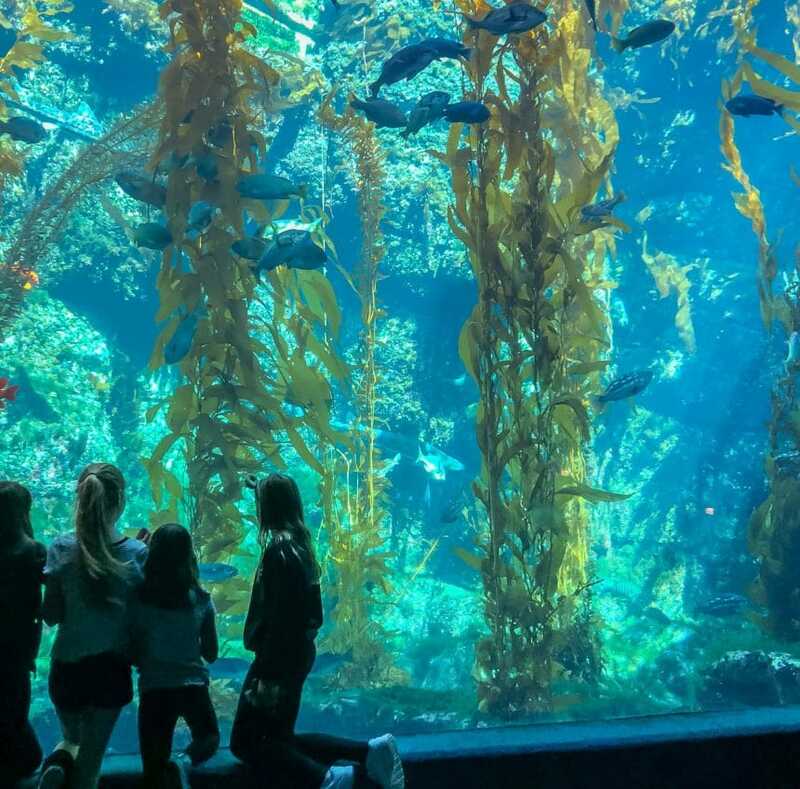 If visiting with kids, you must visit the Birch Aquarium which showcases research by the Scripps Institution of Oceanography in awesome aquarium habitats and hands-on exhibits. 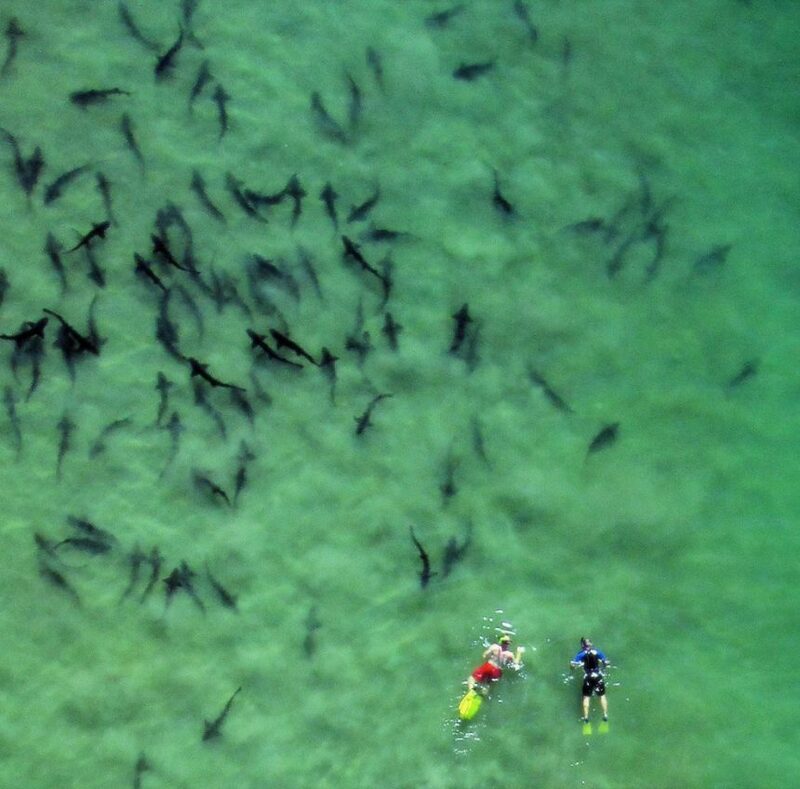 But the most famous attraction in this neighborhood is probably the La Jolla seals and sea lions. These cute and noisy residents of the rocky coastline are a real treat to watch whether you’re watching them from the Children’s Pool, along Coast Boulevard, or by the Cave Store. 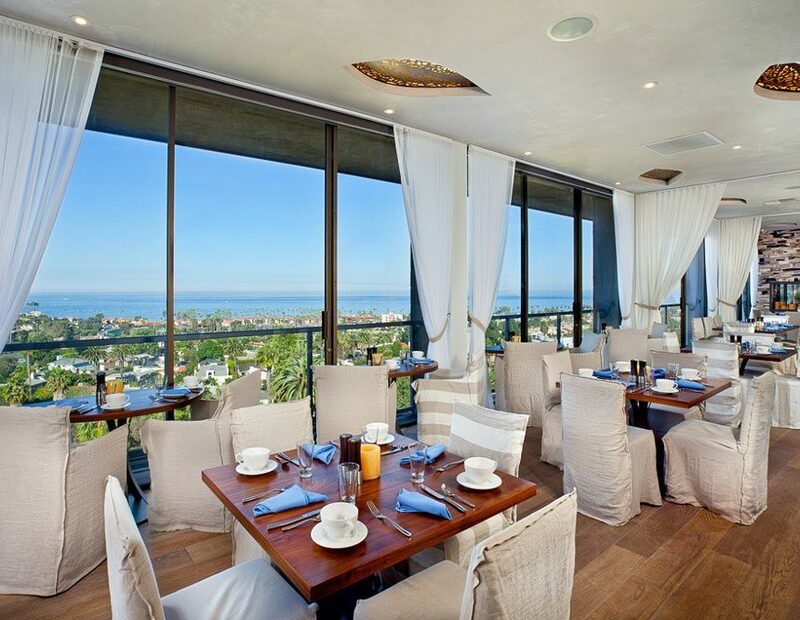 Do you have to spend a lot of money to have a great time in La Jolla? Absolutely not. 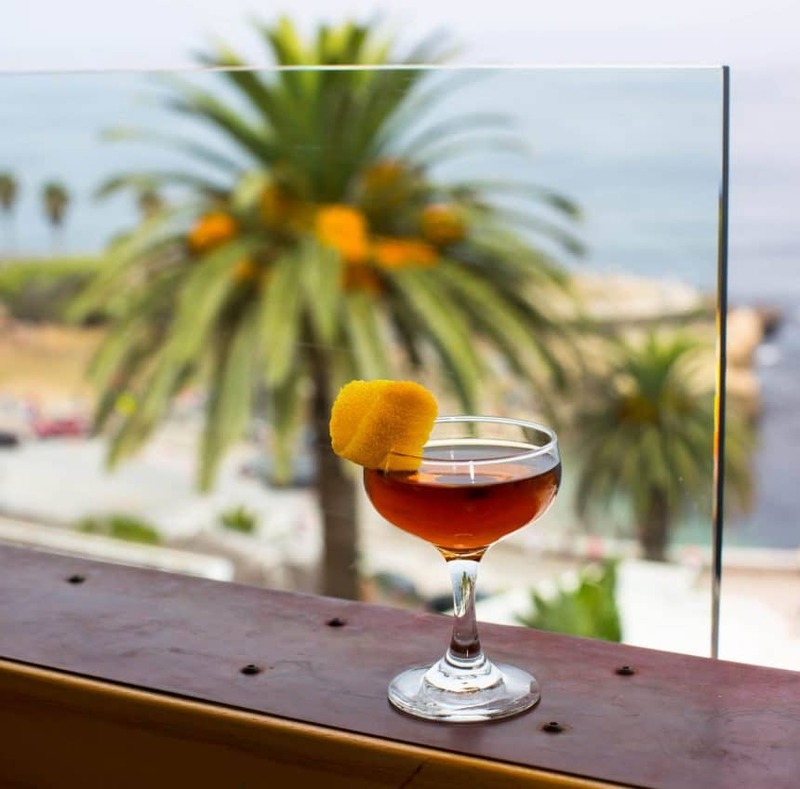 There are plenty of free things to do in La Jolla, and while going to the beach is one of them, that’s not all there is to do in the neighborhood. If you’re traveling with kids, check out the playgrounds like La Jolla Recreation Center, which is an amazing place for kids to let out some energy. La Jolla also has some of the best tide pooling in California – just be sure to bring rubber soled shoes. Want to relax? 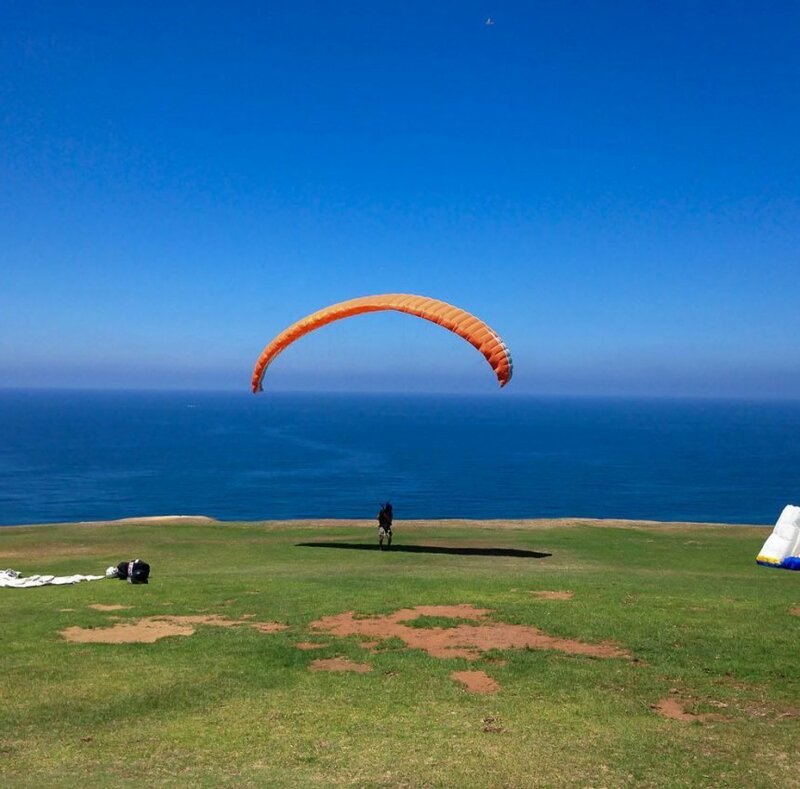 You can sit back in the grass and watch the parasailers lift off at Black’s Beach or have a picnic at Ellen Browning Scripps Park. I’d also recommend checking out the Stuart Collection sculptures at UC San Diego and taking a walking tour of the beautiful murals of La Jolla. 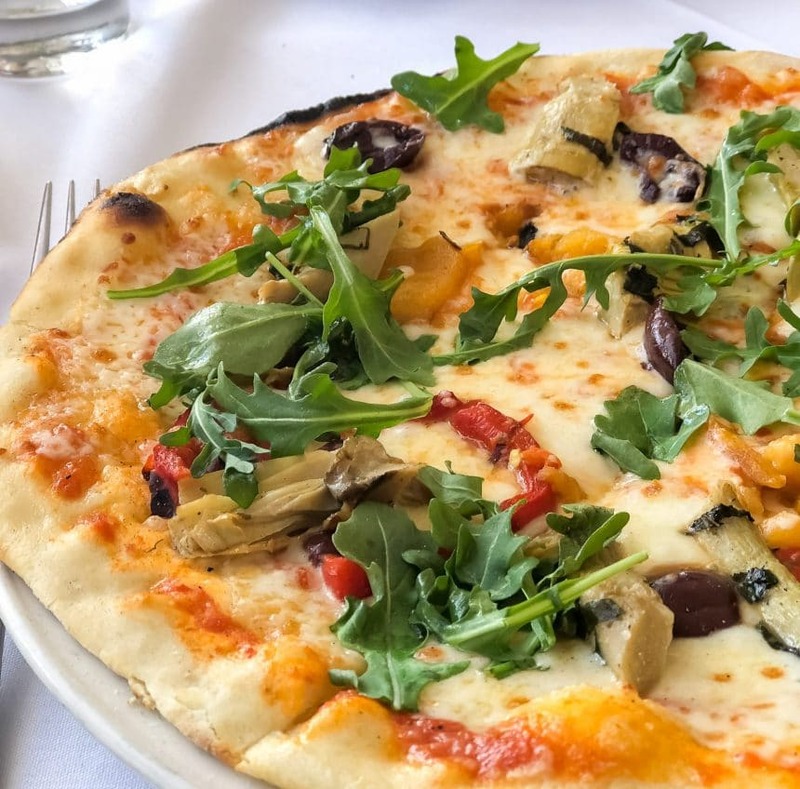 La Jolla hasn’t always been known for its restaurant scene, but today it is widely recognized as a foodie hub where you’ll find some of the best seafood, California cuisine, Japanese fusion, along with great pizza and the freshest tacos around. 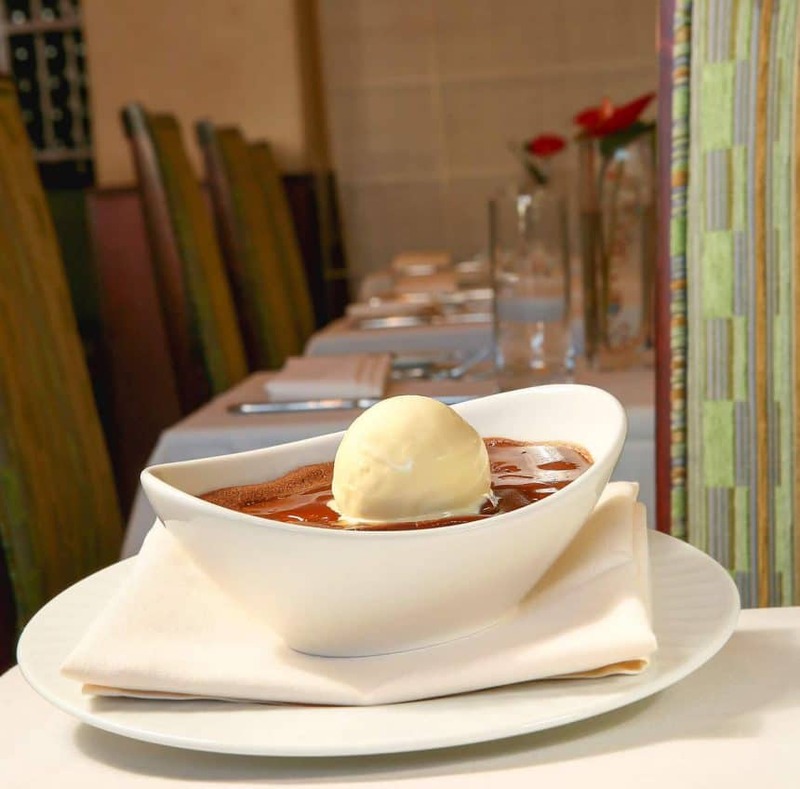 It’s hard to choose the best La Jolla restaurants because there are so many, but some of our favorites are George’s at the Cove, Herringbone, Catania, and Himitsu. 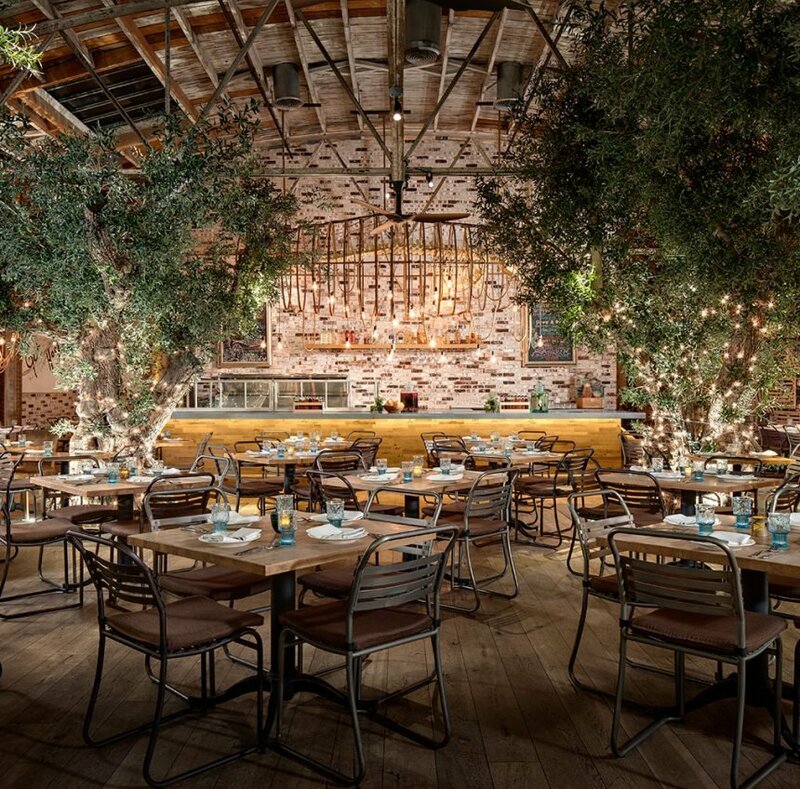 I also have some good news for anyone traveling with kids, which is that pretty much all La Jolla restaurants are family-friendly — even when you’re looking at higher-end spots. 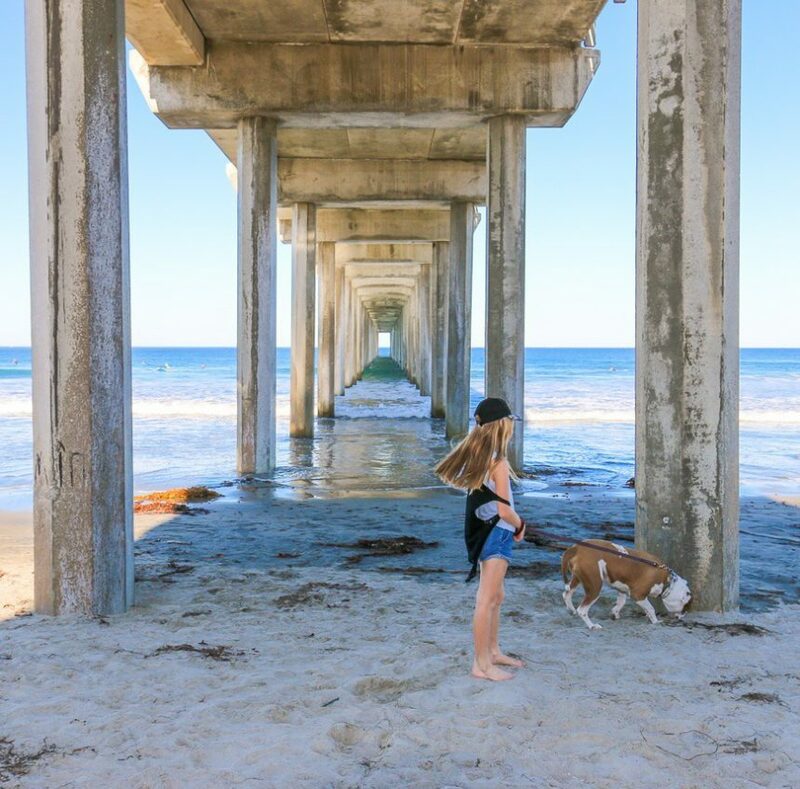 Beautiful beaches and gorgeous views aren’t all La Jolla has to offer. The shopping in La Jolla is some of the best in all of San Diego. 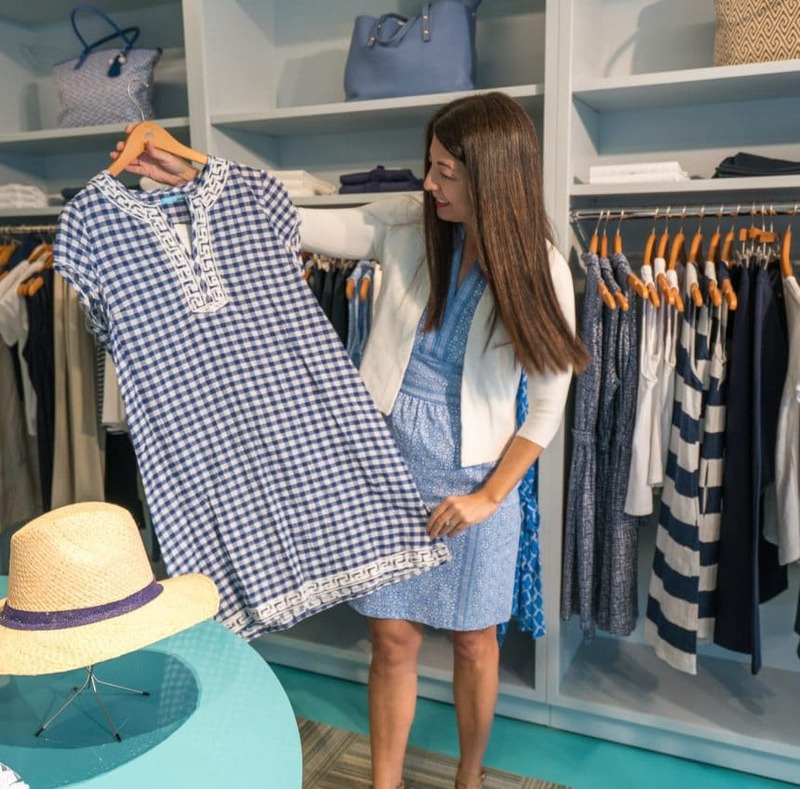 La Jolla offers lots of upscale boutiques and high-end shopping destinations, so plan to enjoy some retail therapy during your stay. You can, of course, shop for souvenirs, but you can also enhance your wardrobe with staples from American and European designers both well-known and obscure. Most of the best shopping in La Jolla is in the village. You can easily hit the shops on Prospect Street, Ivanhoe Street, Herschel Streets, and Girard Avenue during a single pleasant stroll. Along the way, you’ll pass lots of wonderful cafes and restaurants where you can recharge your batteries in the middle of your shopping spree.